Our Unitarian Universalist tradition draws from many sources. The six primary ones are listed in the front of the grey hymnal, the page before hymn #1, if you want to glance at them. We tend to know our principles better than our sources, but the sources are what really ground our faith and uniquely distinguish it from other secular and religious institutions. 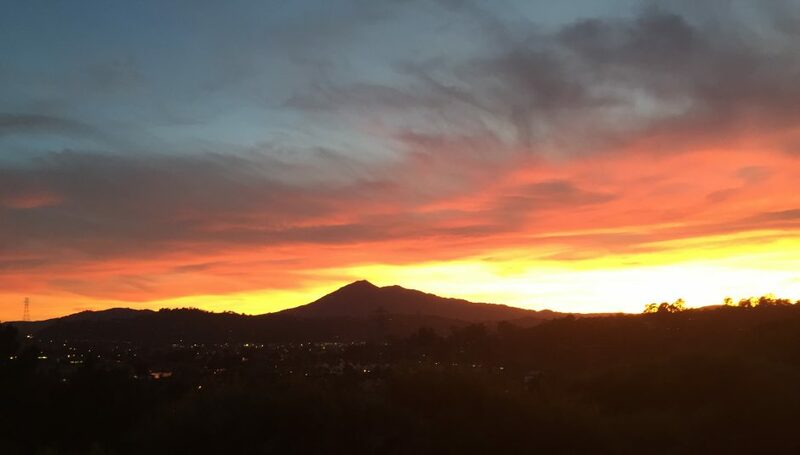 Ellen just spoke of one of those sources, the fourth, which is “the Jewish and Christian teachings that call us to respond to God’s love by loving our neighbors as ourselves.” Ellen learned much about love and about justice from her Jewish education. Martha and Waitsill Sharp were inspired to act from that same source. In 1939, most Unitarians identified as Christians, as followers of the prophet Jesus. Not exclusively so, of course; we almost always have had a liberty clause which guaranteed freedom of thought and belief for both congregations and ministers. I will talk more about the history of our free faith in a couple of weeks, but today I want to focus on the story of the Sharps. Martha and Waitsill Sharp confronting evil directly as they worked to rescue people. They left their young children and risked their lives for people they did not know in another part of the world. Why did they do it? Why would anyone leave their children? They were already leading lives of meaning. They were already making a positive difference in the world. Martha was a social worker. Waitsill was a minister. They both were aware of the terrible threat of the Nazis. Waitsill preached about it, more than once I am sure. They knew what they believed. They knew that all human life had value and that everyone deserved justice and compassion. As Unitarians, they also knew that humans had a responsibility to act. They could not stand by and expect God to save anyone. But I don’t think they would have gone at all except for one very important reason. They were asked. They weren’t the first people asked. 17 ministers had already said no, but for the Sharps when someone asks you to do something important, you had to at least think seriously about doing it. They said yes. They traveled to Prague. So much of our Unitarian Universalist history comes from that time and place. While in Prague, they met Rev. Norbert Chapek, the creator of our flower communion. They were working with the newly formed service committee, the committee that commissioned Hans Deutsch to create our symbol of the flaming chalice. The chalice was used for the rescue work that the Sharps and others did. Every time we light our chalice we are honoring that legacy of confronting evil with justice, compassion and the transforming power love. Like any legacy, we can either ignore it or try to live up to it. I think most of us try, the best we can, to do what our faith calls us to do in the world. This congregation’s mission statement, “Live your sacred • Transform through love • Act with courage” is certainly in keeping with that legacy. The powers and structures of evil are rising today, in our very own country. How will we answer the call to confront them with justice, compassion, and the transforming power of love? We have virtually the same story that most countries had during WWII. Jews were denied entry with the excuse that some of them might be Nazi spies. Today the excuse is that they might be terrorists or criminals. But people are not skittles, but it can make for some interesting metaphors. I found the following on facebook written by Eli Bosnick. I am going to try and skip over some of the profanity. The Sharps loved their lives, but they knew that other lives were just as important. They were willing to eat the skittles. 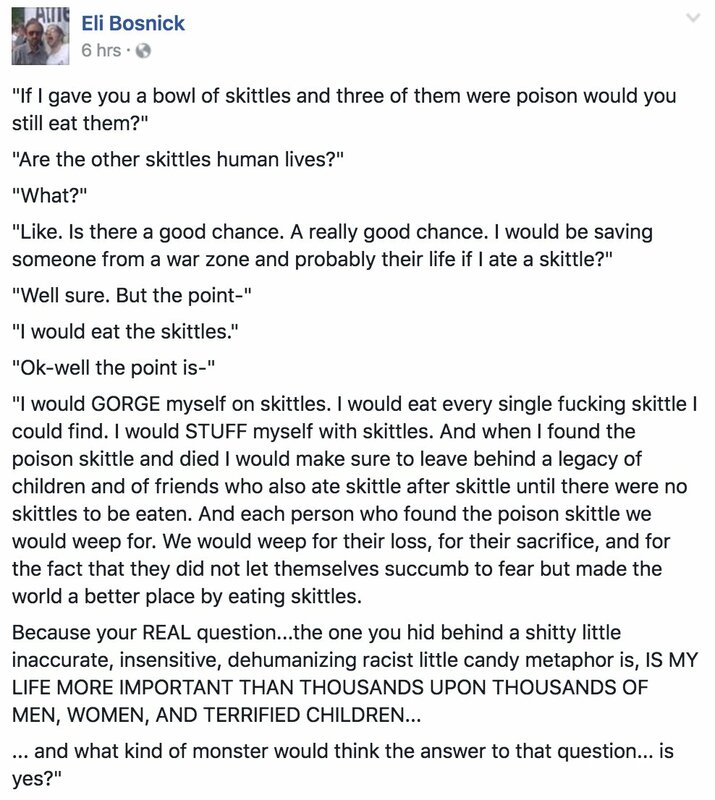 Would you eat the skittles? Today, in America, the forces of hate, misogyny, and white supremacy have been unleashed. They have always been here, but they are more blatant because of the rhetoric of the Presidential campaign. I can’t tell you how to vote, but I can say to vote your conscience and your values. There is so much at risk in this election for so many vulnerable people. Meanwhile while white college boys spend a couple of months in county jail after they are convicted for brutal rapes. Ending racism will require much more than putting a slogan on a wall, or even preaching a sermon about it. The Sharps risked all. Their actions saved lives, but their own children were hurt by their absences. Their marriage fell apart. What are you willing to risk to save lives? Black lives because we believe black lives matter? Immigrant lives, Muslim lives, because those lives matter too. I’d use the phrase “all lives matter here” if that line had not been corrupted by those who believe that only the lives of people who are exactly like them really matter. The Sharps did not care about the religion or the race of the people they saved. And back then, Jewish people were considered to be a different race. We know now that race is simply a social construct, that there is no intrinsic difference between any of us, no matter the color of our skin. . But even in that time of ignorance, the Sharps knew, because of their Unitarian faith, that all life is sacred, to be treasured and protected. Others had said no, but the Sharps said yes when given the opportunity to make a difference, to do something important with their lives. Will you say yes if someone asks you to do something scary for justice? It doesn’t have to be life threatening, although these days you can never tell. Maybe it is just speaking up when you hear hate expressed in a public place – like when you hear someone in the grocery store rudely telling someone else to speak English instead of Spanish. Anyone ever heard that? I have, even here in California where Spanish was spoken long before English was. Maybe it trying to talk to some of your relatives who have been swayed by the politics of fear. Explain why you care, why you are willing to take a risk for justice and compassion. Explain that your faith calls you to have a warm heart and an open mind. Tell the story of the Sharps. Explain how that story has inspired you. They were asked and they said yes. Consider yourselves asked. May it be so. Your work and your home? How strong is your call? With love in your heart? Defying the Nazis: The Sharps’ War is an account of a daring rescue mission that occurred on the precipice of World War II. It tells the story of Waitstill and Martha Sharp, a Unitarian minister and his wife from Wellesley, Massachusetts, who left their children behind in the care of their parish and boldly committed to multiple life-threatening missions in Europe. Over two dangerous years they helped to save hundreds of imperiled political dissidents and Jewish refugees fleeing the Nazi occupation across Europe.